Here is a first look at some more artwork created by Lisa Waters. It is inspired by her research on the life and work of 19th century amateur botanist and collector Jessie L. Hussey. …this painting is about the last letter that Jessie wrote on 20th February 1899 to Prof. J. Agardh in Lund, Sweden; this letter had black mourning bands around it, as her father had just died. Jessie wrote that she was too sad to be able to work and yet, she also wrote that “it is a blessing to be able to work while life lasts” and that she hoped to soon send him some more algal specimens. Sadly then Jessie herself suddenly became seriously ill and died on 16th March 1899, only 36 years old. It is so poignant that by the time this last grieving yet life affirming letter reached Prof. J. Agardh by ship, Jessie herself was dead. 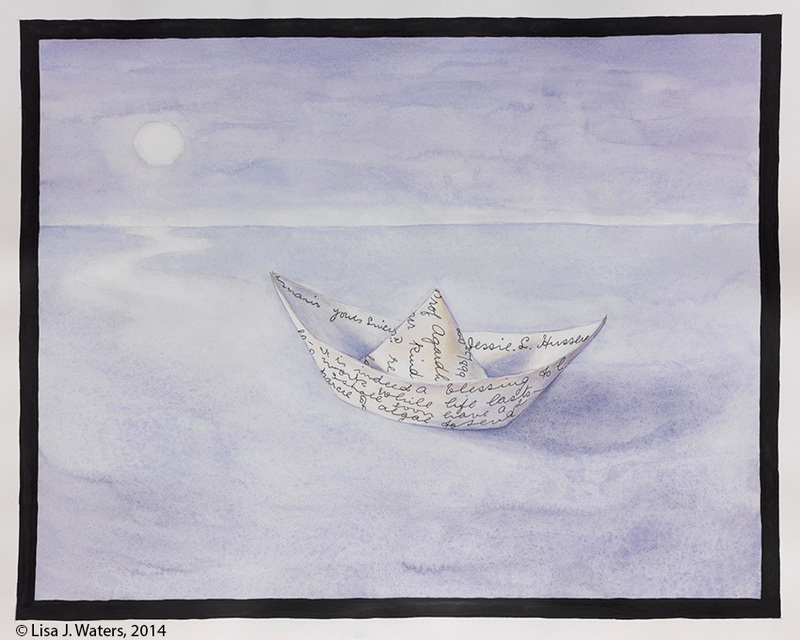 I have painted Jessie’s letter as a little paper boat with her own handwritten words and it is sailing out into the twilight with black mourning bands around the edge of the painting for her own death. Please click here to see Lisa’s previous artwork and more information about her project. She is continuing her work, so keep following this blog for updates. This entry was posted in News on 7 October, 2014 by Jürgen.